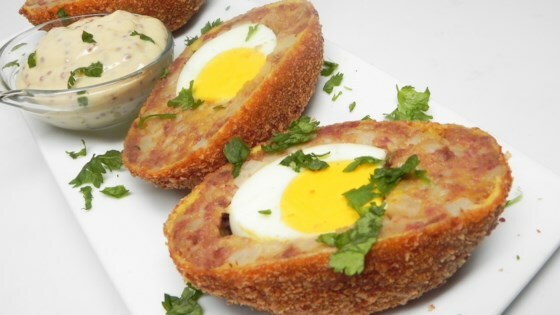 "Traditional Scotch egg amped up by replacing corned beef hash for the sausage in this delightful version..."
Mix whole grain mustard, Greek yogurt, garlic powder, and cayenne pepper in a small bowl until well blended. Place 2 beaten eggs into a shallow dish; place potato flakes in a separate shallow dish. Divide corned beef hash into 4 portions. Form corned beef hash around each egg until the egg is completely encased. Roll encased eggs into the beaten egg and coat with mashed potato flakes until covered. Drop 2 eggs into the hot oil and fry until brown, 3 to 5 minutes. Remove with a slotted spoon and place on a paper towel-lined plate. Repeat with remaining 2 eggs. Cut the lengthwise and serve with mustard sauce.